Home › Blog › Magento › Pick Your Platform: Is Magento Community or Enterprise Better for Your Business? 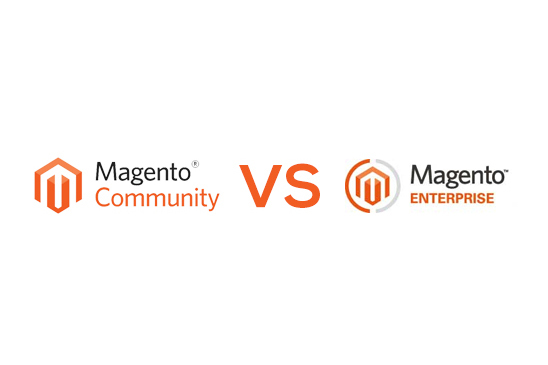 Pick Your Platform: Is Magento Community or Enterprise Better for Your Business? You know you need an e-commerce platform. You’ve settled on Magento. (That was a smart choice, by the way.) But what version of the famous e-commerce platform is better for your business needs – Community or Enterprise? To answer that question, you have to take a bigger look at your business: what are your needs, goals, budget and overall objectives? And how much IT manpower, time and resources do you have to spare? The Community version of Magento is the free, open-source version of the platform, which does not include tech support. (However, you can access the online Magento forums for some peer-to-peer assistance.) Enterprise, on the other hand, is the premium, “pay to play” version of the ecommerce software: for a fee, you get expert support, plus considerably faster performance. The question is, which is worth more to you? If you have knowledgeable IT personnel and the time and expertise necessary to maintain the free version of the software, Magento Community may be right for you. But keep in mind, free sometimes means “free.” (We’ve said this before.) “Free” software includes a lot of hidden costs: time, manpower, support, sometimes hardware purchases. If you have the infrastructure in place to be able to maintain the free version of Magento, more power to you. But make that decision carefully. Magento Enterprise does cost a little more upfront – but, as is the case with most things in life, you get what you pay for. For smaller sites that aren’t handling a huge amount of traffic, Magento Community may be just fine. But if you’re anticipating a lot of activity on your e-commerce site, you’re much better off with Enterprise. No matter which edition of Magento you choose, it’s vital to pick a capable hosting company. A good e-commerce host can smooth out a lot of the performance and tech support issues you’ll experience with Magento Community, and can keep the faster, more complex Magento Enterprise version up and running 24/7. (The more capabilities a platform has, the more potential it has for “interesting” problems.) Pick a company with a proven Magento track record: this e-commerce platform has always required special handling. For our post on spotting fake Magento hosting reviews, click here.